At AlwaysFreshFish.com our company will sell only farm-raised (aquaculture) Catfish fillets. The Catfish are raised to marketable size, then processed (filleted and skinned) at the farm where it is then shipped to distributors. 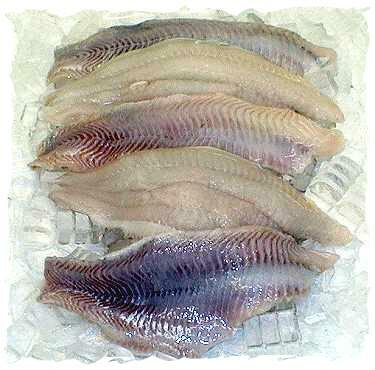 Fresh farm raised Catfish fillets are firm, white in color and have a delicate flavor with a small flake when cooked. At AlwaysFreshFish.com our farm raised Catfish fillets are sold skinless and boneless. Upon order, the Catfish fillets will be packaged to your weight specifications and delivered to your door via a next-day transportation company. Catfish fillet size will average between 7-11 ounces. 1 lb. Fresh Catfish + 4 lbs. Add. Selections = 5 lb. Total Order OK! Rinse Catfish fillets under cold water and let drain. Blend Seasoning Mix and Bread Crumbs together. Dip Fillets in Egg and Milk mixture. Dip in Seasoned Bread Crumbs being sure to coat evenly. Pan Fry in hot oil until nicely brown on both sides and cooked through. For additional information on Fresh Catfish, please e-mail AlwaysFreshFish.com.